Two-space notchers are groups that consist of a chain on the second line, interrupted by a notch of two empty spaces on the second line and two to four stones on the third. The term was invented by James Davies. See also Notchers, One-Space Notchers and Three-Space Notchers. The rule for two space notchers is, depending on how you want to formulate it, either "Five die, Seven live" or "Six is unsettled". For the time being we'll leave proof of the two extremes to you and demonstrate the unsettled case. If Black goes first, he can live. White is again rather stubborn to keep trying with 2 and 4, but after 5 Black has completely constructed the two eyes he needs to live. 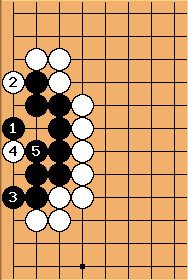 Eggplant86: isn't it better style for B to move black 1 to black 3? I don't see a way for W to kill and it could be better yose. 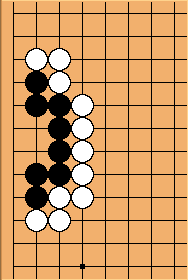 White can start his attack with a hane at 1. (Reducing your opponent's eye space like this should always be the very first option you consider when examining the status of one of his groups, by the way. See also the article on How to approach a life and death problem.). Even if Black were to resist, White can keep his group dead. unkx80: See also Two Space Notchers Not Fully Connected. tapir: Black can tenuki twice here. Actually, for white has to surround first before trying to kill. All 222 are "Black can live, White can kill" except 222WW, which is dead. All 223 are alive, except for 223WW, where Black can live and White can kill. 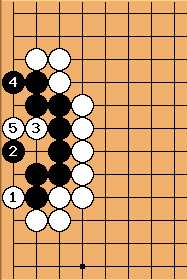 However, 223WSNotcher shows a killing sequence for White.